We are pleased to bring you another before and after project here on homify, and we are sure this one will bring inspiration to all, as it is indeed a terrific transformation, but the result is far from ostentatious. Therefore, this project can show us how we can renovate on a budget and bring about a great change. As you'll see when we start exploring this project, it encompasses the renovation of a modest apartment, but the change is really something to take not of. The newly transformed space has a distinct minimalist style to it, and is both aesthetically pleasing and functional in terms of space and simplicity. Join us now to wander through the process of this renovation and be amazed by the ingenuity involved! Here we have our first view of the apartment before the transformation took place. As we can see from this image, the dimensions of the area are quiet limited, so this was the first consideration for the architects, MC2 Architecture, to take into account whilst planning the renovation. In addition to the already limited dimensions of the room, the colour of the walls (which is already in the process of being stripped in this picture) had become dull and bland, making the space feel even smaller. We can also see the opportunity to use lighting strategically here to make the space feel larger and accentuate the necessary features. Now, can you believe that we are looking at the room of the same dimensions we were looking at before? The new space is entirely transformed, and the main ingredient is the whitewashing of the whole area. This immediately expands any spacing, enlarging the perceived boundaries of the room, and creating less visual static. In addition to the white surroundings, the architects also installed perimeter lighting on the ceiling. This lighting feature is situated along the wall, and this strategic use of light makes the space feel even larger. The room is minimally furnished, ensuring that if remains clean and with an atmosphere of lightness and spaciousness. The frame-less furniture also contributes to the light feeling in the room. 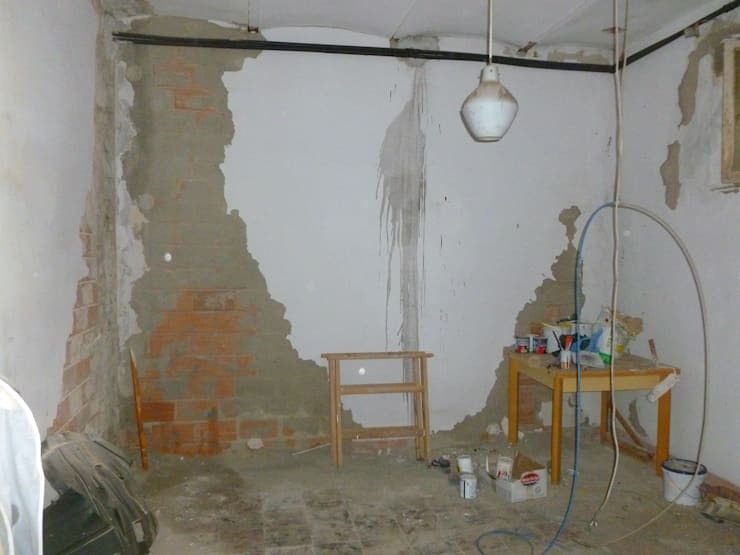 Here we have another image of the apartment before its renovation, and it is very discouraging, to say the least. If we were faced with such a sigh, I doubt that we would have known were to even begin. As we can see in the lower section of the image composite, this space had either been a storage or cleaning room, and it was filled to the brim with clutter of all kinds. We certainly don't think that this is an effective use of space, and neither did the architects. 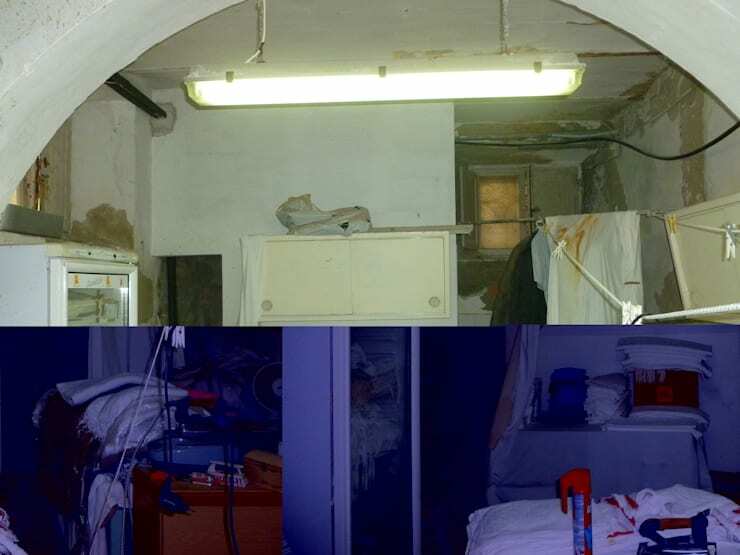 On the upper part of the image, we can see that the room had been furnished with very old and outdated features. The whole space was crying out for a makeover! The results of the apartment's transformation do not cease to amaze us! Just look at this brand new kitchen space! It is in an entirely different league than the area we saw before, and all of this has been achieved with a modest style and minimal decoration. Once again, the entire room (walls, floor and ceiling) had been coated in white, expanding the perceived size of the area. In addition to this, white features had been used in this kitchen throughout, including for the kitchen cabinets and drawers, the kitchen island, door, and the ceiling lamp above the work area. All of this combines to create a cool, modern space that is super easy to maintain. 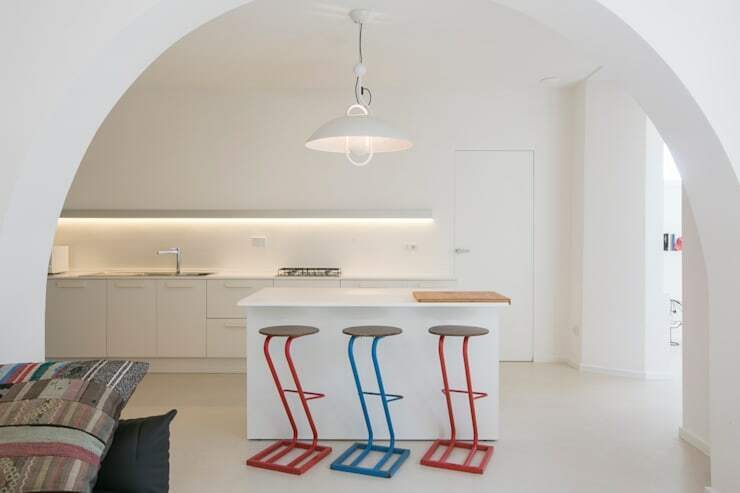 Lastly, the decorators decided to add just a small, playful touch with the quirky and colourful stools accompanying the kitchen island. This creates a focal point in the room, and adds a little character. 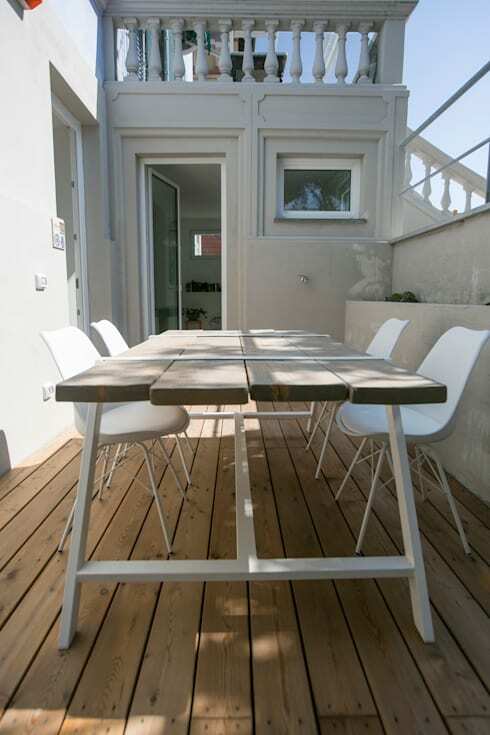 Before we leave off with this project, we wanted to spend a minute to take a look at what the architects and designers did with the apartment's balcony space. This small area has been transformed into a tranquil sanctuary by the addition of a wooden deck and a matching dining table with wooden top. The Scandinavian style chairs along the table suits the general minimalist theme of the apartment, as it does this charming outdoor space. Just think of the romantic dinner parties the inhabitants can host out here! Now, take a look at how you can: Take your own balcony to new heights! 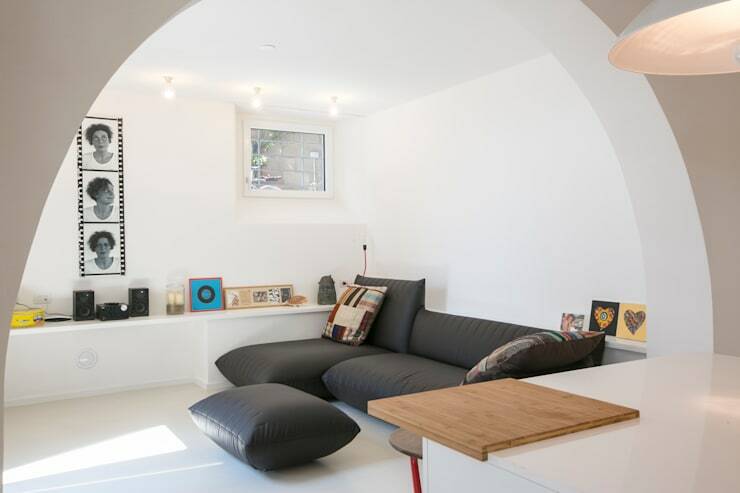 Do you enjoy the minimalist style employed in this new apartment?